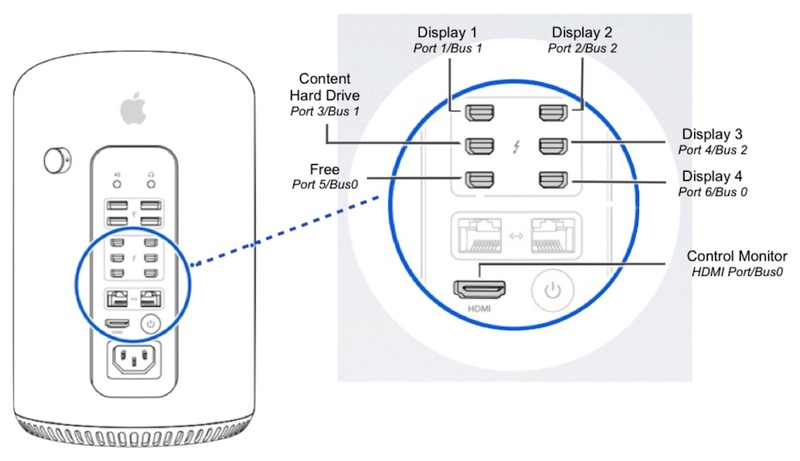 All displays must be connected to the right ports and busses of the Mac Pro. It is very important to connect the displays to the right thunderbolt busses (see figure below). Do not attach more than two displays to any bus. The HDMI port (Control Monitor) is part of Bus 0. 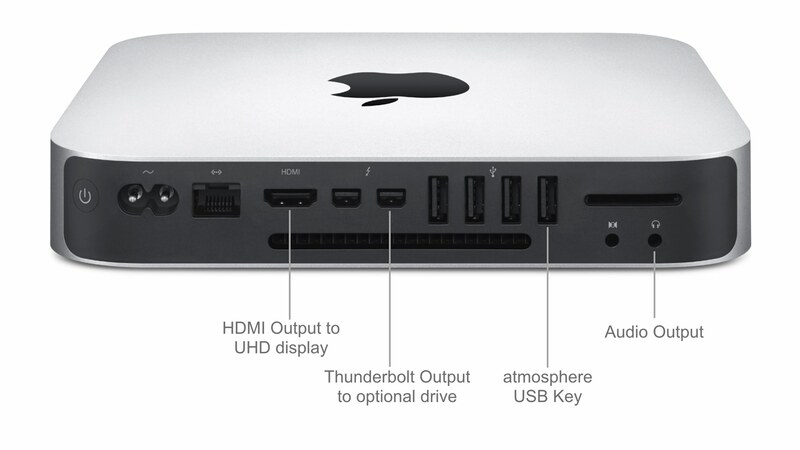 The 4 display screens must be connected to the Thunderbolt Ports 1, 2, 4 and 6 using active Mini Display Ports to HDMI or DVI adapters (see hardware requirements). The Thunderbolt Content Drive should be connected to Port 3/Bus 1. The atmosphere media player© uses the internal OS X display arrangement under System Preferences. Note: make sure that the atmosphere media player© is not running while doing screen arrangement. We assume that you can see all 5 screens while doing the screen arrangement. If this is not the case, it is possible to do the desktop configuration using a remote desktop connection to the Mac from a laptop or other computer where a view of the 4K wall is possible. Screen Sharing can be enabled on the mac and then a connection can be made using any VNC client, such as: /System/Library/CoreServices/Applications/Screen Sharing.app on a Mac or UltraVNC on Windows. Alternatively, an application like TeamViewer could be installed on the Mac enabling connection from another computer with TeamViewer installed. When starting the Mac Pro with all 5 screens connected, all screens will be shown next to each other in landscape format in the screen arrangement window. The desktop must be constructed from left to right with the Control monitor far left. – Click on each screen to locate the control monitor, grab it with the mouse and move it totally to the left. – Grab the Doc (white bar) with the mouse and move it to the control monitor. The main menu is now on your control monitor. The 4 main screens are now rotated to 90° in portrait format. Swapping displays: after rotating screens, the four display screens might not be in the right order. The final position should be 1 to 4 from left to right. Please rearrange the screens into the correct order. Open the atmosphere media player and select (under Library) the test video to verify the screen arrangement. This test video also serves to configure the physical aspects (formats, Color settings, etc..) of the displays. We recommend the usage of EDID managers for media installation. These Managers simulate a constant connected display for the Mac Pro and make it the ideal solution to prevent video loss and screen arrangement errors if displays are disconnected for any reason. Sometime the screen configuration is lost when OS X reboots. AMPDisplayConfig.app Manually launch and save the desktop configuration (EDID to screen mapping). AMPDisplayRun.app Apply the saved screen configuration by running this app from the User’s login items. 1. Put AMPDisplayConfig and AMPDisplayConfigRun into /Applications. 4. 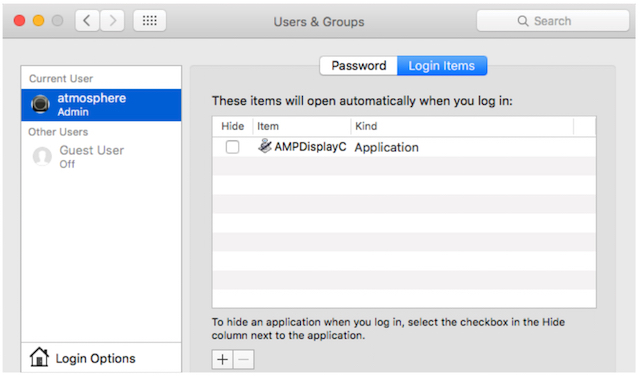 Add /Applications/AMPDisplayConfigRun as a login startup item. It should run as the first item. *The Audio Output is for an external sound system, when using the internal display speakers, the audio will be sent with the video signal out of the HDMI output.